We finally are getting into the grove and getting our math notebooks underway! 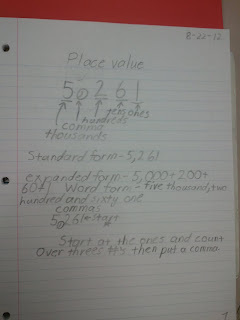 Today we talked about place value as well as commas! I'm super excited about doing these again this year and sharing my updates with you as we go. Here is today's photo. I've also found some great Pinterest Boards for math notebooks! Check them out! Tomorrow we will be gluing some stuff in so be sure to check back!